At the Mashup Camp pre-conference dinner tonight there were a number of demos, all of which were interesting. A non-public service that stood out was flyspy, a search engine for airline tickets that will change the way we all travel. Purchasing flights purely based on price has been around for a while, but the consumer has never had the power to quickly and at a glance evaluate the cheapest days to fly nor the cheapest destinations to fly to. Flyspy reverse engineers some of the mystique associated with the airline industry and makes it extremely transparent. Tonight I got a look at the service, and while it is still in it’s early stages it is very cool. The way it works is that I give it a departure city and a destination city and optionally a departure date and length of stay. The search result, which returns very quickly, will present me with a graph of flight prices over the next 30 days so that I can quickly look at which days are the cheapest to fly. To book a flight I just click on the point in the graph. Simple. If I am trying to decide which destination is cheaper, I can overlay another airport on the graph and then compare the results. 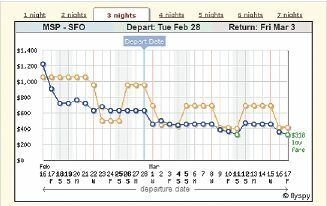 In the screenshot you can see that it has plotted the prices for arriving in both San Francisco and San Jose. The end result is that in very little time I can find the best day to fly out, the best price and also the best destination. Flyspy has all the right elements – a good idea, a simple user interface and an immediate value proposition for the user. Even better, it takes an industry that is stuck in the old times and shakes it up (I was going to say blown to bits). Flyspy was founded by Robert Metcalf (no not that one) who has been working on the problem for 2 years after experiencing frustrations with the airline booking system (someone pissed off the wrong programmer). Even though he had no previous experience in the industry Robert was obviously very knowledgeable on how it all worked and how to build a business from what he has built so far. Flyspy will have an API that will allow other developers to tap into its technology and to integrate it with other services. Robert is expecting to move out to the valley sometime soon and has been self-funded to date (though he is in the process of seeking investment). Overall a very cool service that epitomizes what the new web is about. Flyspy should go public in a few months – you will hear more about it here and probably feel the distruption.